alaTest has collected and analyzed 205 reviews of Sanyo Xacti VPC-CA6. The average rating for this product is 3.6/5, compared to an average rating of 4.0/5 for other Camcorders for all reviews. Reviewers are impressed by the image quality and size. The portability and price also get good comments. We analyzed user and expert ratings, product age and more factors. Compared to other Camcorders the Sanyo Xacti VPC-CA6 is awarded an overall alaScore™ of 82/100 = Very good quality. alaTest has collected and analyzed 56 user reviews of Sanyo Xacti VPC-CA6 from Amazon.co.uk. The average user rating for this product is 4.2/5, compared to an average user rating of 4.0/5 for other Camcorders on Amazon.co.uk. Comments about the portability and image quality are overall positive. The price and size also get good feedback, whereas some have doubts about the battery. alaTest has collected and analyzed 92 user reviews of Sanyo Xacti VPC-CA6 from Amazon.com. The average user rating for this product is 3.1/5, compared to an average user rating of 3.9/5 for other Camcorders on Amazon.com. Reviewers really like the zoom and size. The portability and price also get good feedback. Water splashes stopping you from taking photos under the sun? Now you can brave the elements and snap away with Sanyo's Xacti VPC-CA6. While the splash-proof case and tiny design of the Xacti VPC-CA6 will appeal to some, those after good quality video and stills with an easy to operate control setup should look elsewhere. An extreme bargain or just annoying? Sanyo's VPC-CA6 excels at being small, portable and easy to understand. Using it, however, reveals more than a few flaws in the implementation of its design. This camera/video camera hybrid is water- and snow-resistant, but is it critic-proof? The outer casing of the compact and ergonomic Xacti CA6 has been specially designed to protect the camera from splashes and wet hands. Now you can enjoy recording more of the action at the poolside or on the ski slopes, without having to worry about moisture from water or snow. 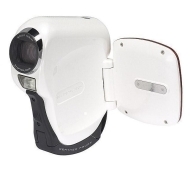 The Xacti CA6 employs a richly detailed 6.37-megapixel CCD and SANYO's proprietary image-adaptive data processing technology. This ensures low noise in dark areas, as well as more beautiful realization of skin colors. A high-powered 5x optical zoom lens lets you get up close and personal with your subject - even more so if you pair it with the 12x digital zoom. The Xacti CA6 sports a vertically oriented design that's easy on your wrists - essential, given the ultra-long 80 minutes of continuous recording it can deliver. Using the highly compressed MPEG-4 format enables the Xacti CA6 to achieve 30 fps, VGA-size (640 x 480) recording. With an optional 4 GB memory card, you can store up to 4 hours of superb and memorable video clips. What's more, still and video images can be captured simultaneously. Using the supplied cables, captured stills and video clips can be played back on your TV or PC. On your PC, you can edit them at your leisure, send them as e-mail attachments or post them on a website. Connect the camera directly to a PictBridge-compatible printer, and selected snapshots can be printed out from the printer with no need for a PC. Meanwhile, compatibility with Exif Print and PIM III helps to preserve the effects of the camera's original settings.